Is There More to Tacoma than Aroma? Tacoma don’t get no respect. At least, not from its big sibling to the north. Even if it’s the third most populous city in Washington, and only a half hour away by car, Tacoma has been playing second fiddle to Seattle for, what, forever? This situation is not helped by Tacoma’s public relations problem—the sulfur-like, pungent odor that sometimes permeates the air from paper mills to the east, sarcastically known as the Tacoma Aroma. For me personally, I have never stopped in Tacoma, not even to sightsee. Truthfully, the only thing I notice about it when driving past along I-5 is the Tacoma Dome, a runt compared to Seattle’s colossal, now long-gone Kingdome, replaced by CenturyLink Field, even if the Tacoma Dome is far more attractive than the Kingdome ever was. My wife and I decided to change our perception of this city of 320,000 by making it a destination among our recent flurry of staycation activities. Not only that, we decided to take Amtrak there, again leaving the driving to public transportation entities, including a bus from Bellevue to King Street Station. We planned our arrival to the train station so we’d have enough time for dim sum at Jade Garden in the International District, one of the very few places open for breakfast at an early hour. King Street Station is so much nicer than it used to be, entirely restored from years of neglect and ill-advised “modernization” efforts. The ugly acoustical drop ceiling has been removed and the interior restored to its original appearance, even when many architectural elements have long since been removed and lost. The clocktower, a replica of the one in St Mark’s Square in Venice, has also been structurally reinforced. The Amtrak Coast Starlight train bound for Los Angeles was a pleasant surprise. While it has luxurious first-class and sleeper cars, the double-decker coach cars feature large, comfortable seats whose legroom puts airline pitches to utter shame. Not only that, there is a foot rest and a folded section of the seat that can be flipped up to provide support for your lower legs. With the back rest fully extended, it is possible to enjoy much better reclining comfort than any airline’s. The Starlight also has a lounge car that has floor-to-ceiling windows for admiring the passing scenery, attended by National Park Service guides to elaborate on points-of-interest. Not once did we feel short-changed in comfort. We enjoyed the experience so much that we were truly disappointed to deboard at the Tacoma Station after only a 45-minute ride. Amtrak no longer uses Union Station in Tacoma, the beautiful building taken over by the U. S. District Court, but stops at a smaller, more utilitarian station more removed from the new downtown core. Our first destination was the Glass Museum, about a mile on foot from Amtrak. Along the way, we walked past the monumental Tacoma Dome Station that serves Tacoma Link light rail, Sounder train and a number of Pierce County buses. Along Puyallup Avenue, a nicely restored Texaco garage building has been converted to an art gallery. To bypass the train yard and industrial section, the newly constructed D Street overpass connects areas on both sides of the Thea Foss Waterway to the Dome district, with pedestrian lanes in both directions. It took us a while to recognize this in order to get to the museum, having at one point gone down a dead-end street. 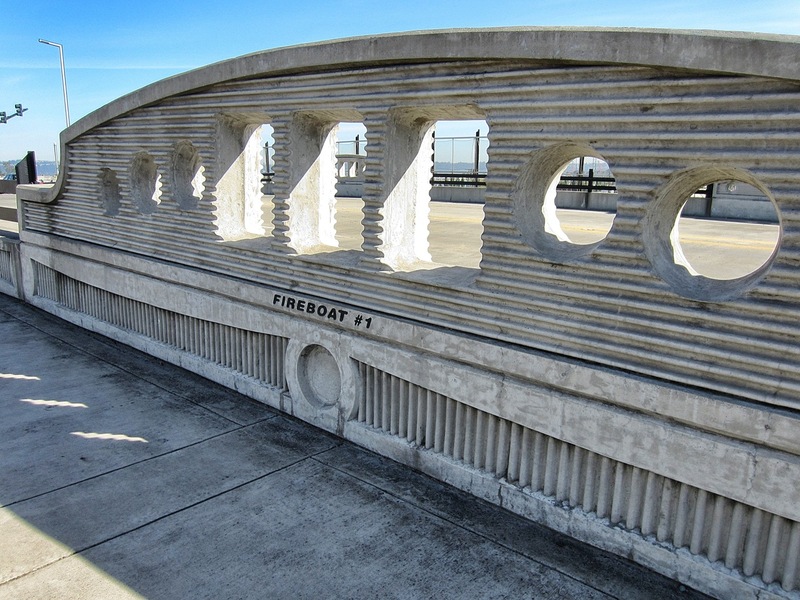 Once on the overpass, which we mistook for a freeway onramp, we noticed built into the concrete walls separating foot and vehicle traffic shapes that represent the tugboats that used to ply the many waterways here and beyond. The approach to the museum along Dock Street provides a panoramic view of the striking East 21st Street cable-stayed suspension bridge, part of SR 509 that spans the Foss Waterway. Also visible from the elevated walkway is the vast Tacoma rail yard. As we approached the Museum of Glass, an enormous architectural cone that appears tilted on its side came into view, part of the striking design. The galleries themselves are housed in an adjacent building. The famed Canadian architect Arthur Erickson designed the complex. As the name suggests, the museum is a tribute to glass arts, a movement in Washington that was promoted by Tacoma native Dale Chihuly, who in fact also had a significant hand in the museum’s plan. There is an impressive system of stairways that encircle and lead away from the cone, letting you get different views of it. The structure has spiraling rows of parallel and crossing, diamond-shaped sections of glass, a pattern reminiscent of a pineapple. Inside the museum, the studio glass of Australian artists was featured in the current exhibit, “LINKS: Australian Glass and the Pacific Northwest.” While the Australians also excel at blown glass, their work with fused glass, textures and opaque surfaces was awe-inspiring to me, many cold-worked pieces whose intricate details and subtlety of color are so different from the brightly colored, blown glass so popular locally. We could have spent our entire time in Tacoma in this museum alone. Cobi Cockburn, “Presence.” Cold- and hot-formed glass made to resemble the structure of grass. Mel Douglas, “Incline #3.” Blown, cold-worked and etched glass. Each line is scored by hand. Steve Klein, “Exploration, Lybster I.” Fused glass reflect undulating hills and rolls of hay. Scott Chaseling. The interior of this painted, fused and blown glass piece is as interesting as the outside. Giles Bettison, “Textile 10, #14.” Fused, blown murrine glass made to look like textile. Tom Moore’s pieces are whimsical, almost Dr. Suess-like. Kathy Elliott, “Reclining Capillary Leaf.” Hot-formed and wheel cut glass. There is much detail in the cut portion of a eucalyptus leaf. Kirstie Rea, “Fine Line II.” Kiln-formed and lathe-cut glass made to resemble a pitchfork. The Bridge of Glass connects the Museum of Glass to the downtown core. It was designed by Dale Chihuly and architect Arthur Andersson, spans 500ft across I-705 and has several eye-catching displays along its length. Two 40-ft crystal towers look like suspended chunks of blue glacial ice. The south-facing Venetian Wall showcases 109 of Chihuly’s pieces, back-lit by the sun through frosted panes. The Seaform Pavilion makes you feel as if you’re going through an ocean tunnel with colorful sea creatures floating overhead. To the south, the bridge has an expansive view of the Tacoma Dome, 21st Street bridge, I-705, Foss Waterway and railroad tracks. It’s an impressive vista of modern man’s engineering and industrial accomplishments and a modern pathway connecting parts of the new, urban Tacoma. To the north is Union Station that is on the National Register of Historic Places and now a U. S. District Courthouse. Unfortunately, we didn’t have time to visit and admire its interior. At the western end of the bridge facing Pacific Avenue is the Washington State History Museum, owned and operated by the Washington State Historical Society. Though built 1995, the building’s architecture echoes the arches of Union Station just to the north. Inside there are thoughtfully designed areas that cover both the natural and human history of Washington. The current special exhibit was one devoted to D. B. Cooper, the airplane hijacker who extorted $200,000 from Northwest Orient Airlines, jumped out of flight 305 by parachute, was never caught and subsequently became part of modern folklore. The exhibit was attended by quite a few people, many of whom were obvious experts in this incident, judging by their conversations. Cooper’s escapade prompted the FAA to issue stricter regulations to prevent future such hijackings, regulations that could be seen as the precursor to procedures employed by TSA today. We had a late meal at Harmon Brewery across the street. Also opposite the History Museum on Pacific Avenue was a nicely designed stairway into the heart of the University of Washington Tacoma campus. On our walk back to Tacoma Station, we detected the Tacoma Aroma for the first time. Our return trip to Seattle was on the Amtrak Cascades, a less modern and decidedly less comfortable train than the Coast Starlight this morning. It also stopped at Tukwila Station and was briefly delayed by crossing train traffic that resulted in a longer 75-minute trip. Our day ended when we got back home as the sun was setting. For certain, our appreciation of the new Tacoma has grown measurably. This entry was posted in Washington, West Coast and tagged Museum of Glass, Tacoma WA, urban walks, Washington State History Museum. Bookmark the permalink.